Nearly two years later, the record-breaking snowfall of Winter Storm Jonas is but a distant memory for most Pennsylvanians. But for the Wolf Administration and the Pennsylvania Turnpike, it was a catalyst to look for ways to serve motorists even in the most extreme situations. 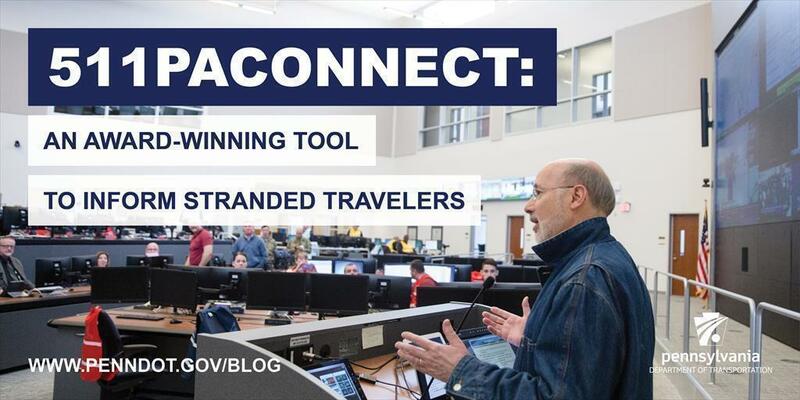 "Following Winter ​Storm Jonas, I asked our agencies to develop a tool to better keep drivers informed about the status of accident cleanup and highway reopening and 511PAConnect was the innovative response," said Governor Tom Wolf in a recent news release. "511PAConnect is the first initiative of its kind to link directly to a targeted group of travelers who are being impacted by, or who are approaching, a large-scale emergency." 511PAConnect was introduced in December 2016 as a tool that provides information to motorists in the event of a long-term road closure due to incidents on state roadways. PennDOT and the Turnpike identify a potential long-term closure. They notify staff at the 24-hour Commonwealth Watch and Warning Center at PEMA. PEMA issues an initial location-based alert to motorists in the area of the closure. Motorists have the option to sign up for automatic text messages or phone call updates, which are generated by transportation staff monitoring the closure. When the incident is over, motorists who registered for the alerts are automatically unsubscribed and all personal data is scrubbed from the system. "Governor Wolf tasked us with developing a service that would provide travelers and our agencies alike with valuable information during an incident," PennDOT Secretary Leslie S. Richards said. "511PAConnect meets that goal and also aims to reach other motorists before they reach the impacted area so they can potentially avoid the incident altogether." 2017 Project of the Year from the Mid-Atlantic Section of the Institute of Transportation Engineers. "The 511PAConnect initiative was a collaborative effort that shows how state agencies can work together effectively for improved customer service to motorists," said PEMA Director Richard D. Flinn Jr. "We are thrilled that the hard work our teams did is being recognized by other groups." PennDOT and the Turnpike used 511PAConnect five times from December 2016 through March 2017. During four incidents, an average of 77 people opted in for follow-up incident messaging over an average of 222 minutes. The system also was activated to inform travelers of a planned exist closure in January. 511PAConnect uses the same technology that PSP uses to issue Amber Alerts for missing children. While 511PAConnect is a great tool in the event of a winter-weather incident, PennDOT urges motorists to prepare now so we can avoid incidents altogether. Find winter driving and safety tips by visiting www.penndot.gov/winter.